New Marx collection is in stores and I had a chance to be one of the first people to try it out. They have some amazing pieces as always. I went to Sportina in Arena Centar and I got two pretty awesome outfits. The first one is a business - casual look. I just love these colourful pants. They are very easy to wear and style in many different ways. I wore them with a white shirt that has awesome details on the back. To make the outfit more interesting I chose Marx gold sneakers. This Marx campaign has a cool message to send: Dare to show your emotions! I think it is a strong message and I would like to encourage everyone to do so. 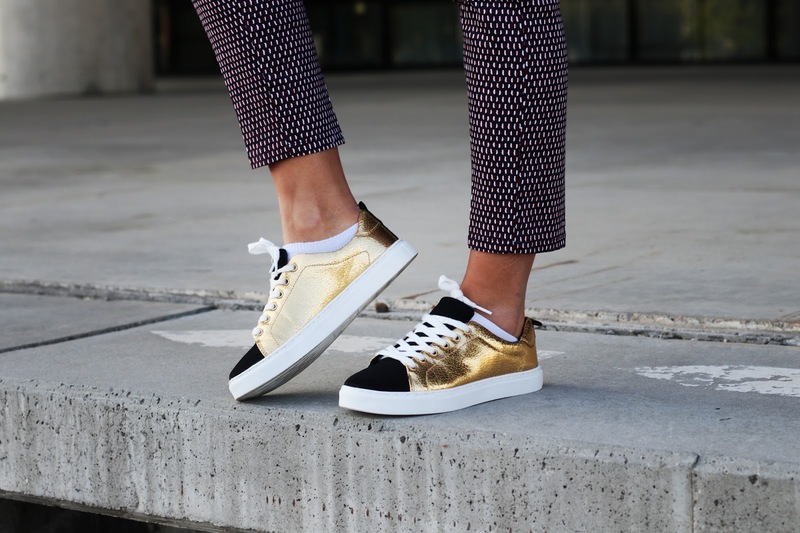 I am showing some bold emotions combining these sneakers with an elegant look. The whole outfit is very cool and I would definitely wear it for every day! Can't wait to show you guys my second look with Marx! Love everything about this look! Those sneakers are SO cute. Sporty and super cute combo!